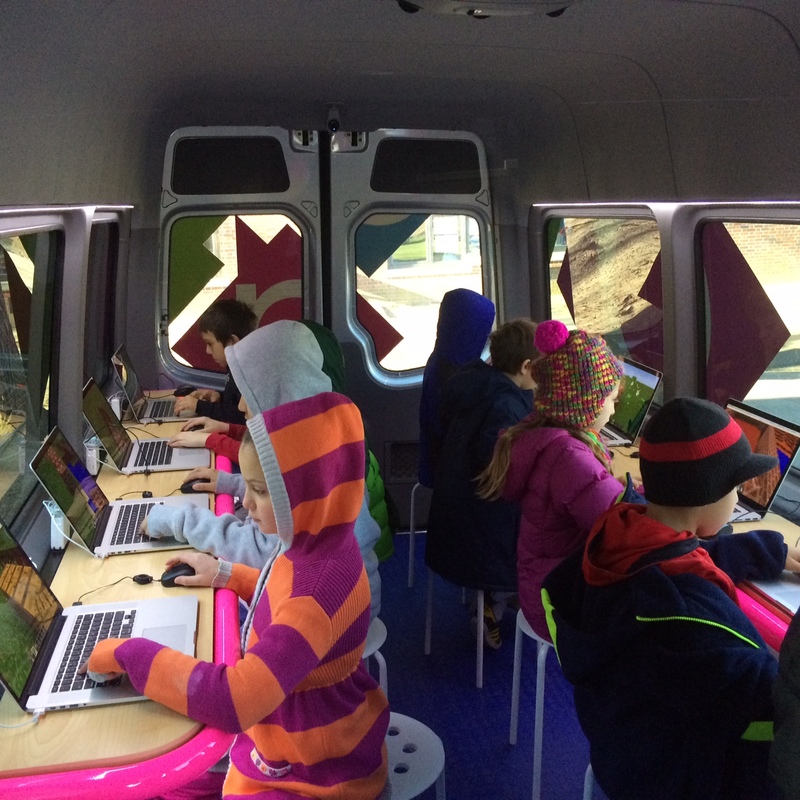 On Saturday, November 22nd, Rob Kissner and Cristina Calabrese of The Digital Arts Experience drove their Mobile STEM Classroom, The DAExpress, to George Washington Elementary school in White Plains, Westchester NY for a mobile Minecraft tournament! The students at George Washington Elementary in White Plains, NY get ready to build a replica of their own school in Minecraft! Whether or not you like Minecraft, kids are simply obsessed with it. Often described as an open ended “sandbox” or virtual LEGO world, it allows the user to essentially create anything they can imagine. Some kids create elaborate homes, others medieval castles. Some opt to recreate famous architectural structures. Whether it’s a small wooden hut or The Great Wall of China, it encourages kids to explore, use their imagination and it certainly promotes creative thinking and teamwork. The mystery of Minecraft’s near-hypnotic effect boils down its flexibility, engagement and community. Like most things, it can be taken to extremes. But overall, kids strategize, plan and connect with one another, learning how to set goals and work together to complete a task. In accordance with PTA President Laura Reidy, Rob and Cristina hosted students 10 at a time who had signed up for different time slotted rounds and were given the challenge to build their own school using Minecraft’s creative mode. Rob and Cristina chose a winner and 2 runner ups from each round who were then entered in to compete in a final round to battle against all of the other winners! The final round challenged the students to build the Eiffel Tower in France. Students took their creative energy and resources to not only construct their own twist on the Eiffel Tower, but to also create stunning scenery around the tower. The winner of the tournament was given a free Minecraft party in The DAExpress at a time of her choosing. All participants left with 3D Printed creepers as well as gift certificates to The DAE! Rob Kissner and Cristina Calabrese of The Digital Arts Experience pose with the winners of the George Washington Elementary Minecraft tournament. All in all, the tournament was a huge success. Students were extremely focused, well behaved and driven to do their best. The DAE never hesitates to say yes to a Minecraft tournament because even though Minecraft is a video game, it has strong educational value as well. Minecraft can have huge educational benefits for children; it can help teach numerous subjects both with and without adult involvement. Learning in Minecraft can be faster than traditional methods of education, as children are often far more motivated, get more practice, and feel that what they are learning is useful. The class in itself is a 3D Animation & Modeling class, but we use Minecraft characters for several reasons. For one, Minecraft characters and objects are all block and cube shaped so they are non complex and easy to model in a 3D space. Also, Minecraft is a huge attractor to kids, so learning a complicated 3D Animation software is masked by the fact that they are driven to create something they are interested in. The DAE also runs a Minecraft Modding & Java class that serves as a Part II class to their Java Coding 101. In the Modding class, kids use their skill in Java, a high-end, industry standard coding language used to create various programs such as Android apps, to create their own modifications to Minecraft. Minecraft in itself is programmed using Java code, so the class allows students to open it up, explore, change things around, experiment and create their own customizations to the game! Another class The DAE runs that can be related to Minecraft is 3D Printing. 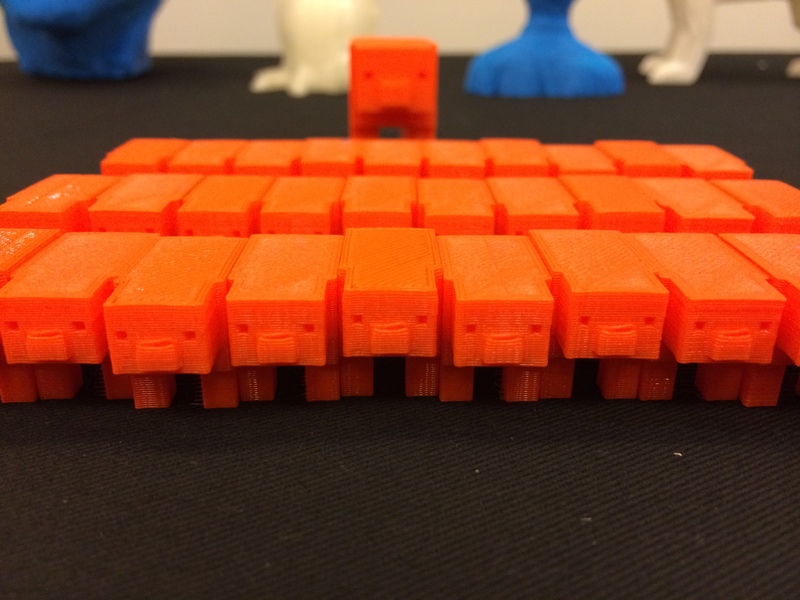 While in most 3D Printing classes, kids are encouraged to engineer and model their own original objects, many kids choose to create Minecraft themed models. What’s great about 3D Printing is that the final result is kids get to actually print their models to take home! It starts off with an idea, then transforms into a model, and finishes with physically printing a 3D object. Talk about full circle! Interested in learning more? View our upcoming January 2015 class schedule here: https://campscui.active.com/orgs/TheDigitalArtsExperience#/selectSessions/630701. 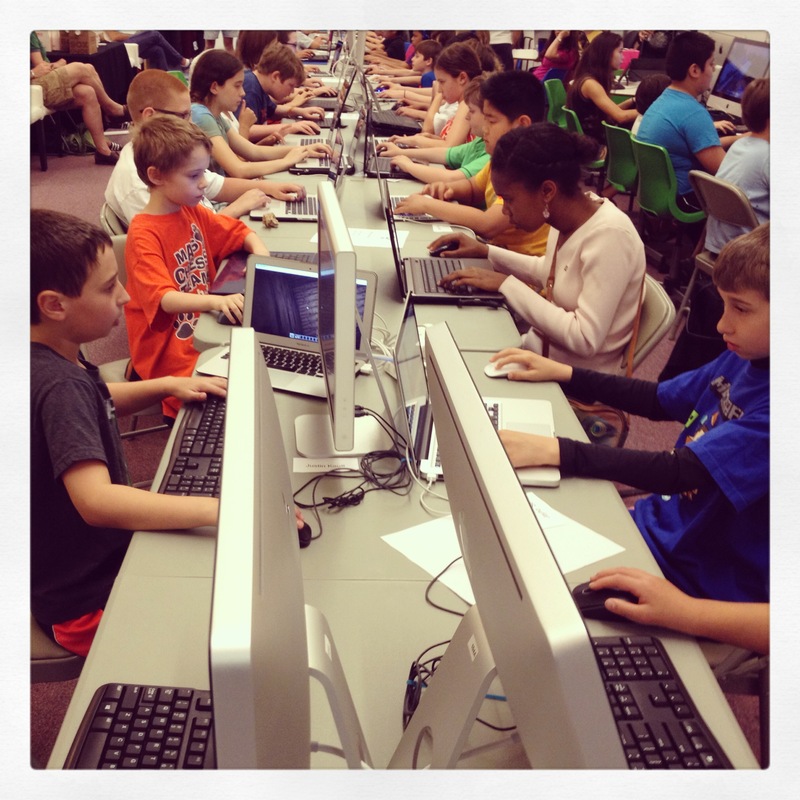 The DAE’s 4th Minecraft Tournament a Smash Hit! White Plains, Westchester, NY– The Digital Arts Experience hosted it’s 4th ever Minecraft Tournament on Saturday, June 21st. Sponsored by the Microsoft Store in the Westchester Mall, they provided The DAE with 3 Surface Tablets and an XBox360 to raffle off to 1 lucky winner. The tournament was the biggest one to date with over 65 kids in attendance. At around 1PM, The DAE opened its doors to start the registration process. Once all checked in, kids were escorted to their places by a DAE Staff member. When everyone was just about all settled, DAE founder Rob Kissner and Co-Founder Cristina Calabrese announced the tournament rules. Animation Instructor Nicholas Sceusa gave out the categories for the kids to choose from: housing structures. Participants had 1 hour to build a house of their choosing. The DAE Staff continued to walk around and moderate the event, and movie-themed music played in the background to set the gaming atmosphere! After the hour was up, judges went around and chose winners for each category. 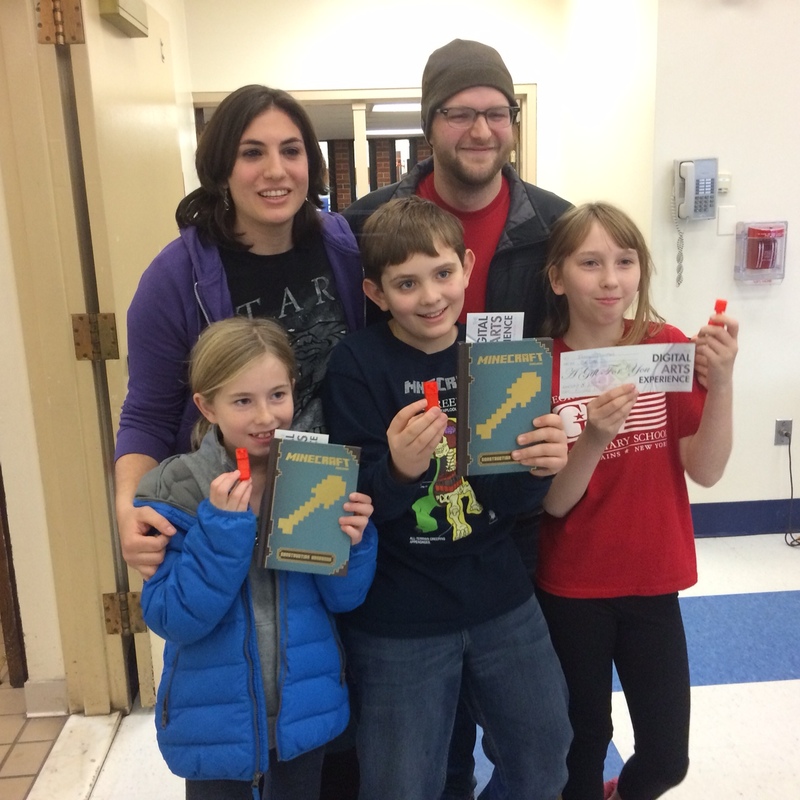 Winners received a DAE gift certificate, as well as 3D Printed Minecraft Pickaxe that was printed on their Makerbot Replicator 2 3D Printer. Once the winners were announced, Rob Kissner randomly chose a winner for the big grand prize – an XBox 360! 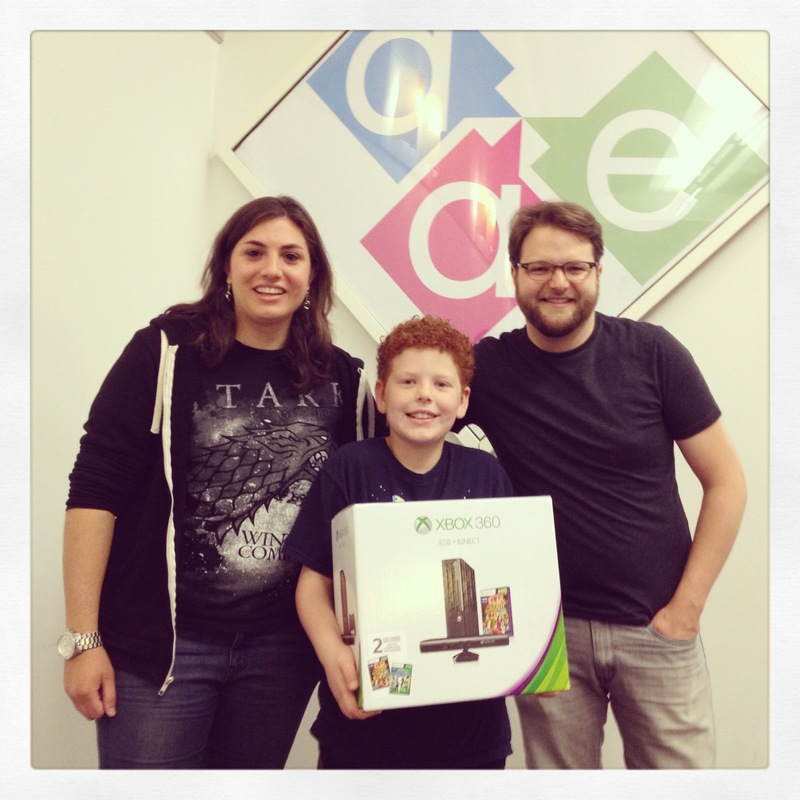 Cristina & Rob pose with David John, winner of the Xbox 360! Thanks for attending our 4th Minecraft tournament on Saturday! We had an absolute BLAST and the attendance was our biggest turnout yet. We’re so happy to have had you a part of the event. Big congratualtions to all of our winners – including David John – the winner of the XBox 360! And Ryan P., whose building got burned to ashes by the pesky Ender Dragon. Additionally, The DAE is proud to announce that we will have an Exhibitor’s Booth at this year’s “Mine O Rama” event in NYC on July 12th & 13th. We will be located in the The GSFE STEM Pavilion for the event, where we’ll have the opportunity to discuss the importance of STEM education and how our programs tie into it. If you will be attending Mine O Rama, please come find us and say hi! We’ll have a really fun and exciting booth set up.